Thanks to its rarity and beauty, the pearl is as prized as a precious gem, but it is not formed by geologic processes like precious and semi-precious stones. Instead, the pearl is a product of some species of oysters and other shell-fish, formally called bivalve mollusks. It is formed when irritants become lodged in the soft tissue inside an oyster's shell, and, to protect itself, the oyster produces a coating for the irritant. This coating, called nacre, builds up in many thin layers and creates an iridescent cover over the irritant. The resulting product is a pearl. Pearls have been treasured by rulers and the rich, and they have been described (and used as metaphors for desirable objects) in poetry and song. The lives of those able to find the elusive pearl have also been celebrated. Japanese women called ama who developed the extraordinary lung capacity to dive in deep waters for pearl-bearing oysters are featured in folk stories. French composer Georges Bizet wrote an opera called "The Pearl Fishers" about two romantic young men with the unusual occupation of diving or fishing for pearls. Because of the romance associated with the pearl and its rarity, methods of producing pearls by extending nature's ability to do so have been identified and perfected in this century. The process of using natural methods to produce more pearls than nature can on her own is called culturing. Pearls have been intertwined with history—and historical legend—since Cleopatra's time, when she supposedly dissolved a large pearl in vinegar and drank the potion to demonstrate her infinite wealth. Pearls have been found in the graves of women from Roman times. The largest known pearl weighs about 454 carats and is roughly the size of a chicken egg. The Indian pearl named "La Peregrina," a particularly beautiful specimen in shape and luster, weighs 28 carats, belonged, to Mary Tudor for a time, and was housed in a museum in Moscow, Russia, until the 1960s when it was sold to the actor Richard Burton who presented it as a gift to his wife at the time, Elizabeth Taylor. In 1886, a remarkable natural creation named the "Great Southern Cross" was discovered in an Australian oyster; nine pearls had united during natural pearl formation to produce a perfect cross over 1 in (2.54 cm) long. Pearl-fishing has long been practiced in oyster-bearing waters. Pearls themselves are rare; out of 30 to 40 pearl-forming shell-fish, only one may carry a pearl. But the mother-of-pearl lining the mollusks' shell also has value and is another product of the pearl fisher. The Gulf of Manar on the northwest coast of Sri Lanka is the most important pearl fishery in the world. Other parts of the coast of Sri Lanka, the coast of India, the Persian Gulf near the islands of Bahrain, parts of the Red Sea near the Arabian coast, the island groups in the Indian Ocean, the Pacific Ocean near Japan and Hawaii, and the northwest coast of Western Australia are known for their pearl beds. Monsieur Reaumur, a French naturalist who lived from 1683 to 1757, discovered that the outside layering on a pearl is identical to the inside layering of a mollusk's shell called "mother-of-pearl." The pioneers of pearl culturing, however, were the Japanese. At the turn of the century, Tokichi Nishikawa and Tatsuhei Mise (a biologist and a carpenter, respectively) discovered independently the method of inserting beads and bits of oyster mantle to stimulate pearl production. The champion of Japanese pearl "inventors" was Kokichi Mikimoto who, in 1893, began imbedding a variety of materials inside oysters to experiment with creating perfect saltwater pearls called shinju. By 1905, this son of a noodle vendor had succeeded, and, in 1908, he was awarded a Japanese patent for the process. Mikimoto's pearl farm had 12 million oysters at its peak and manufactured three-quarters of the world's pearls. Mikimoto lived near the city of Toba, Japan, next to Toba Bay. An island in the bay, now called Mikimoto Pearl Island, is home to monuments to this man who is considered a hero of Japanese industry and a pearl museum. By 1920, Mikimoto's technique dominated the world's pearl production, so that, by 1930, Japanese cultured pearls had completely supplanted the search for natural pearls. Mikimoto's pearl farm today is located in Ago Bay south of Toba. The materials for cultured pearls sound simple; they consist of an oyster or other mollusk, the shell nucleus that is to be implanted, a tiny bit of live tissue (from the mantle or lip) from another oyster, and water. Different types of oysters or mussels produce variety in pearls, and the akoya oyster from Japanese saltwater and the biwa mussel from that country's freshwater Lake Biwa may be the best known pearl-bearers. Producers claim freshwater pearls are more natural because nuclei are not used; instead only a piece of mantle is implanted to culture these pearls. All the materials are natural, although human intervention is required. Because the process occurs over several years, a perfect balance of conditions is required for the aquaculture, or growth in water, of pearls. A costume pearl jewelry advertisement from Major's Appliance Store Catalog in Inkster, Michigan, circa 1958-59. For at least 1,300 years, men and women have searched for wild or natural pearls to adorn both clothing and jewelry, and their luster remains appealing today. As early as 650 A.D. , metalworkers set delicate gold rings with naturally occurring pearls. Ancient Scottish jewelry often includes freshwater pearls, generally small and irregular pearls found in freshwater river mollusks. Those who happened on large, oddly-shaped natural pearls, called baroque pearls, often set them in gold and enameled them so that they resembled delicate, precious sculpture. Because it was difficult to find matching, gem-quality pearls, imitation pearls were produced as early as 1300 A.D. by the French, who craved them for decorating luxurious clothing and accessories. They dipped hollow glass beads into an acid in order to produce an iridescence, and then filled the bead for solidity and weight. A few centuries later, these glass beads were coated with essence d'orient, a silvery substance concocted from the lining of fish scales suspended in a solvent. This essence d'orient was later painted or sprayed on hollow glass beads to simulate the pearl. Once cultured pearls were developed by Kokichi Mikimoto and offered to the public in the 1920s, the "pearl craze" began—everyone wanted them, could afford them, and wore them. By the 1950s, actress Audrey Hepburn claimed her only earrings were a set of pearls, and every young woman yearned for a sweater clip or circle pin of cultured pearls. 1 The "irritant" that is surgically implanted in an oyster as the nucleus of the pearl is made from the shell of a mussel. As many as ten different mussel species, including the American pigtoe mussel and the washboard mussel, are used because their shells are as much as an inch thick near the hinge. Twenty of these beads or nuclei, called kaku in Japanese, can be carved from one mussel shell. In a cultured pearl, this nucleus is the major portion of the pearl, because the pearl coating is relatively thin. Many of the nuclei are manufactured in Tennessee where the Tennessee and Mississippi Rivers host the source mussels. 2 Baby oysters, called spat, are born in hatcheries and grown in tanks at the pearl farms. They are matured in baskets in ocean waters ("maricultured") after they are 60 days old, and after they have grown stronger after spending three years in the water, they are large enough to withstand removal and implanting. To implant the nuclei, harvested oysters are taken inside pearl farm "operating rooms" and held together on racks. When each is removed from the crowd, its shell opens slightly, a wedge is inserted so the shell stays open, and an operator opens the shell wider to insert the bead. 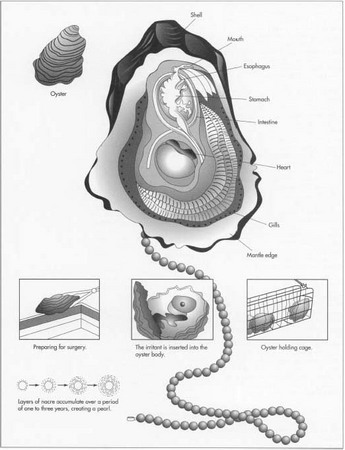 A cut is made in the oyster's body, and the nucleus is inserted along with a tiny cutting of the mantle of another oyster that is sacrificed for the process. The mantle insert stimulates the production of nacre which is excreted by the mantle of the host animal. The oysters are then returned to the water by stringing them on plastic garlands or placing them in oyster baskets suspended from rafts. 3 While the oysters are in the water, the pearl exterior forms over time and fluctuates with water temperature and other conditions. A porous layer called the conchiolin forms around the nucleus and under the nacre. The nacre consists of micro-layers of a specialized form of the mineral calcium carbonate called aragonite. The layers are composed of microscopic plates that make cultured pearls feel rough when they are rubbed against the teeth—a test to distinguish simulated or imitation pearls from natural and cultured gems. 4 The oysters are harvested some time later (depending on the desired finished diameter of the pearl) in winter when cold water slows nacre production and also creates the best color, luster, and orient, which is the ability of the pearl to reflect light. The time of culturing typically ranges from one to three years, and the progress of pearl growth inside the oysters can be monitored with x rays. The pearls are carefully cut out of the oyster's flesh at the pearl farm, and productive oysters can be reseeded several times to produce larger pearls as the oysters continue to grow. The extracted pearls are processed for sale. Typically, the better specimens of pearls are sold in bulk at auctions regulated by governments. From auctions, the pearls move to dealers, then jewelers. The pearl farm may also drill and string its pearls for sale. 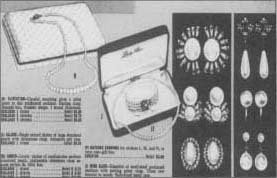 Jewelry fasteners are usually added at another factory. Design of pearls seems an unlikely possibility, but, in fact, a wide variety of colors and shapes exist even through they are extensions of the natural process. The Chinese began pearl design in the twelfth century by cementing tiny Buddhas carved from wood, stone, or ivory or cast from metal inside the shells of freshwater mussels. The Buddhas became coated with nacre, or pearlized, and were a successful product. This practice still thrives in Chinese pearl culturing. The same general technique is used to make half-pearls called mabes. A molded or cut half shape is planted against the oyster's shell; after it becomes coated and is removed, the half-pearl can be mounted on a jewelry backing, like an earring. In color, Japanese pearls range naturally from pink to blue to greenish yellow. Pearls are bleached to lighten these colors and eliminate any surface staining. Colored pearls are made by injecting dye into the porous conchiolin, and the pearl must be drilled to be dyed. The most exotic "designer" pearls are probably the large black pearls cultured in Australia and the South Seas. They are grown in the largest pearl oysters in the world, and a perfect specimen of black pearl can sell in the United States for $40,000. Black pearls also display a natural range of colors from silver to green pearls called "peacocks"—and white. freshwater pearls. These come in irregular shapes determined by the piece of mantle inserted to stimulate growth of a pearl. Human intervention is visible in these designs, because the implanter's skill influences the shape of the resulting pearl. Raising baby oysters in tanks causes them to be less hardy, and pollution of oceans and freshwater sources has also caused oyster and pearl quality to decline. But pearl-bearing oysters are prized animals much like cattle or horses, and their health is carefully guarded by scrubbing them periodically to prevent disease. Sometimes, hurricanes or cyclones affect oysters and their pearl crop, but most often these disasters kill divers, not oysters. Pearl farmers ("pearlers") are also licensed by their governments, so the number is limited and controlled. Some aspects of pearl culturing are closely guarded secrets. Producers often deny that pearls are dyed, enhanced, or otherwise treated, but authorities (and competitors) challenge these claims. Genetic engineering is also used to modify color variation. Culturing times are diminishing, sometimes to less than a year, resulting in a thinner coating of nacre. This is important to buyers because the nacre is soft and can be damaged by perfumes and body fluids. Some exporters and government pearl inspection agencies destroy unacceptable pearls, but the buyer should beware in the pearl market. The mother-of-pearl lined shells from which pearls have been removed are also valuable products. Half shells are cleaned and sold as decorative dishes, and the shells can also be cleaned, cut into shapes, and the shapes polished and inset into all kinds of objects, particularly jewelry, buttons, and furniture. If an oyster's productive life is over or if it fails to produce pearls, the oyster meat is harvested and dried for sale as a delicacy. Flawed pearls not acceptable as gems have other uses. They are ground into powder that is formed into tablets and sold for medicinal purposes. The calcium carbonate in the pearl nacre is valued in this form. Ground pearls are also used in cosmetics and toothpaste, particularly in Japan and China. The cultured pearl has a future that is both iridescent, like the pearl itself, and murky. The pearl shows every promise of continuing value as an ornament and for jewelry. Like other gems and jewelry, it tends to go in and out of fashion. The future of the cultured pearl is compromised, however, by environmental concerns. Pearl-bearing animals tolerate only a limited range of ocean or fresh-water environments, and these have diminished with pollution. Commercial oyster beds are jeopardized by polluted water, as shown by decreased sizes of pearls produced, discoloration, and less translucent appearance. Bauer, Max. Precious Stones. Dover Publications, Inc., 1968. Joyce, Kristin and Shellei Addison. Pearls: Ornament & Obsession. Simon & Schuster, 1993. Kunz, George Frederick and Charles Hugh Stevenson. The Book of the Pearl: The History, Art, Science, & Industry of the Queen of Gems. Dover Publications, Inc., 1993. Ward, Fred. Pearls. Gem Book Publishers, 1995. Doubilet, David. "Australia's magnificent pearls." National Geographic, December 1991, pp. 230-240. Doubilet, David. "Black Pearls of French Polynesia." National Geographic, June 1997, pp. 30-35. Fankboner, Peter. "How baubles are born." Bioscience, May 1996, p. 384. Fankboner, Peter. "Pearls and abalones." Aquaculture, November/December 1993, p. 28. Fassler, C. R. "Farming jewels: The aquaculture of pearls." Aquaculture, September/October 1991, p. 34. Fassler, C. R. "The American mussel crisis: Effects on the world pearl industry, part I." Aquaculture, July/August 1996, p. 42. Fassler, C. R. "The return of the American pearl." Aquaculture, November/December 1991, p. 63. Johnson, Julia Claiborne. "Pearl talk." Working Woman, January 1995, p. 68. Ward, Fred. "The Pearl." National Geographic, August 1985, pp. 193-223.